Deployment of GeoService, HCFacilityLocatorService and HCInformationService in the WSO2 Application Server. 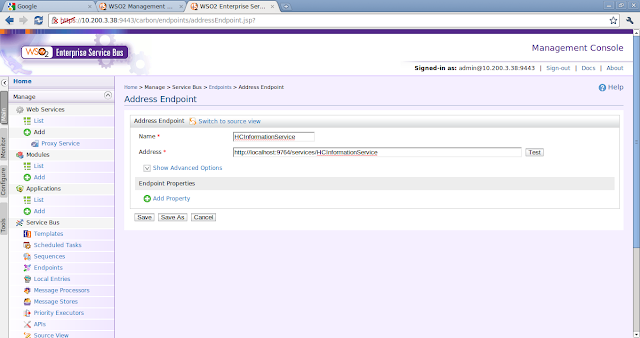 Creation of the endpoints GeoEP, HCFacilityLocatorServiceEP and HCInformationService in the WSO2 ESB. 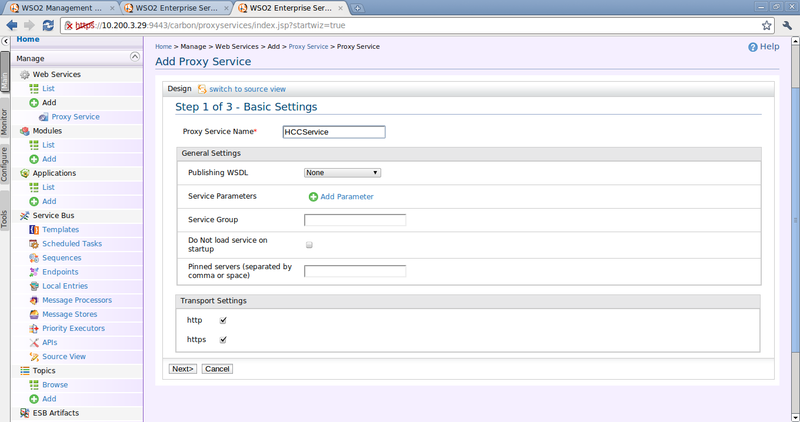 Creation of HCCService proxy service in the WSO2 ESB. Bear in mind that all the artifacts can be downloaded from - https://sites.google.com/site/duckysfilecabinet/dlmi . This will be a step-by-step guide to creating the artifacts that are given. 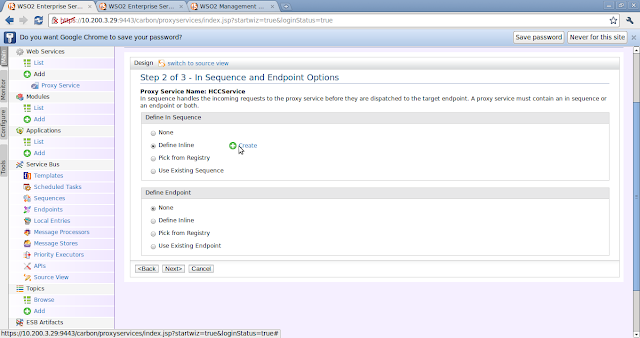 1) Read part 1 of this tutorial to understand the demo scenario. WSO2 Application Service Version - 4.1.2 Go to repository/conf/carbon.xml in from the home folder of the application server and set port offset to 1. The reason being that the ESB and the Application server both need to run at the same time on the same machine and they are configured to run on the same port - 9443. 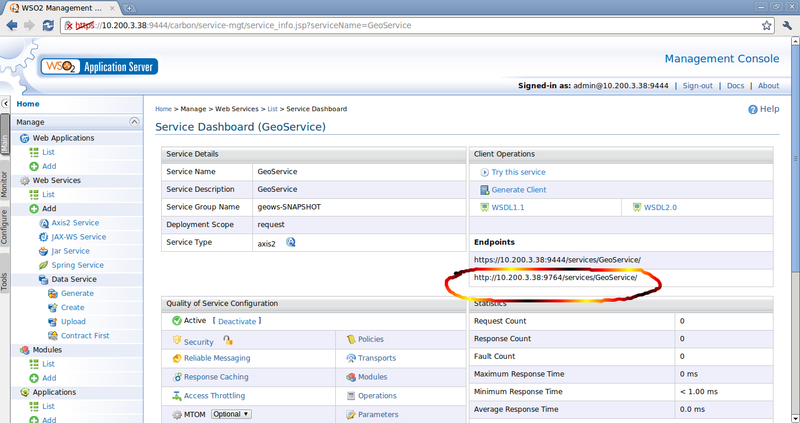 When the port offset is set to 1 in the Application Server, it will now run on port 9444. 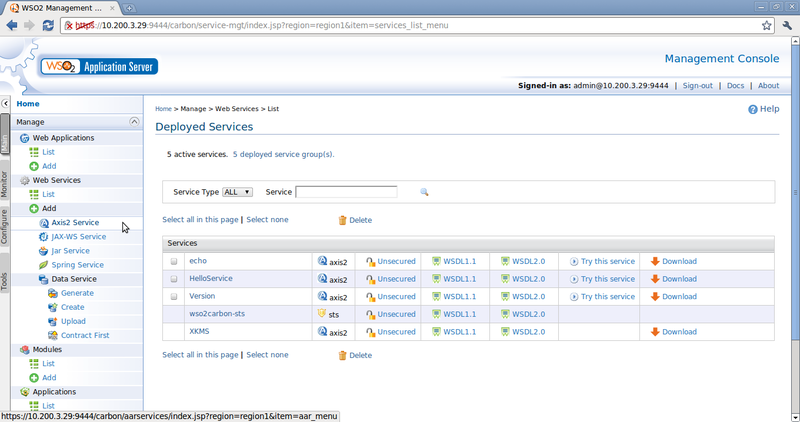 Download the following services and deploy them to AS. Go to the management console of the WSO2 Application Server. Browse and choose the file as shown below. If you click on the GeoService service, the service dashboard will appear. 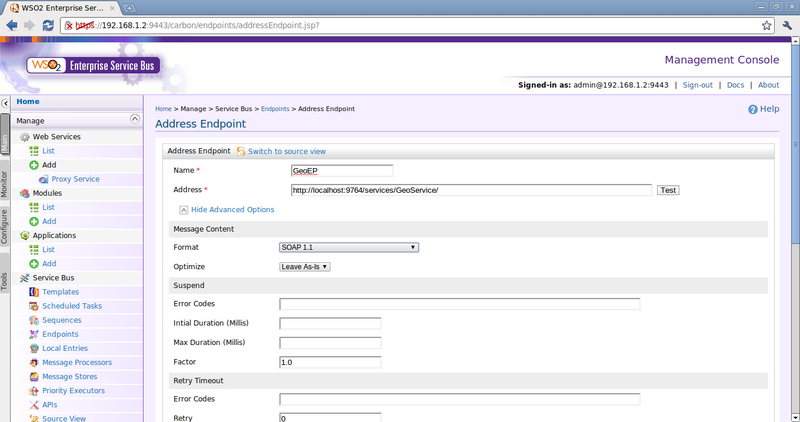 On the endpoints section you will see the http and https endpoint URLs. Similarly you can obtain information about the other services as well. Go to the management console of the ESB. 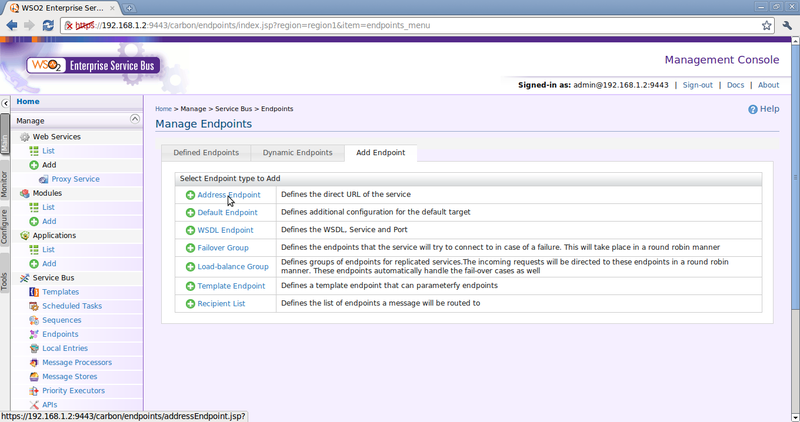 Click on Endpoints under Service Bus and the following screen will appear. Click on Address Endpoint. An Address endpoint is an endpoint defined by specifying the EPR and other attributes of the endpoint directly in the configuration. 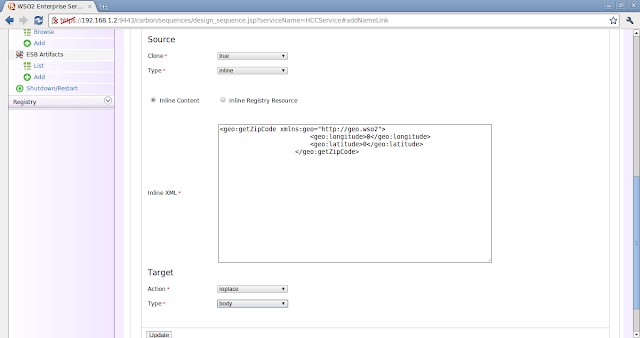 The 'uri' attribute of the address element contains the EPR of the target endpoint. To create the first endpoint, fill in with the following details as given in the screenshot. 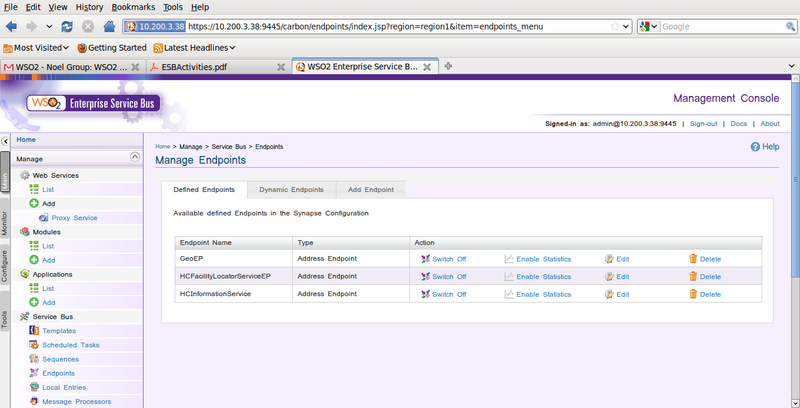 And the HCInformationService endpoint with the following properties. After saving each of the endpoints that were created, you will now be able to view the list of endpoints available in the Defined Endpoints tab. As mentioned in the previous post, HCCService will be the proxy service used. The In Sequence of the HCCService will first call the GeoService service with the longitude and latitude values. 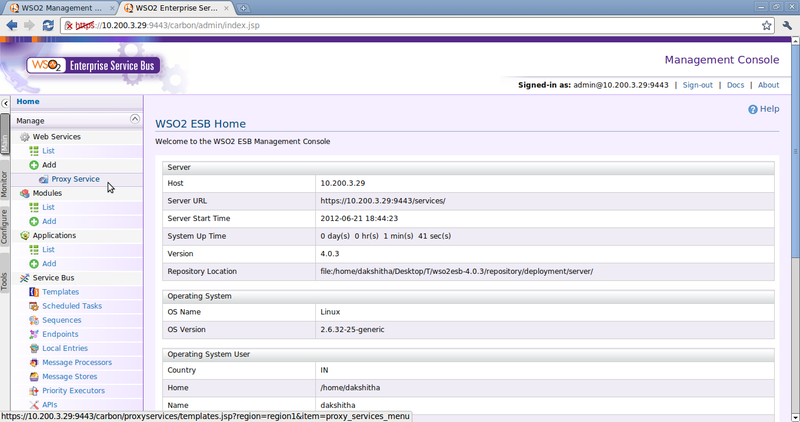 Go to the management console of the WSO2 ESB. 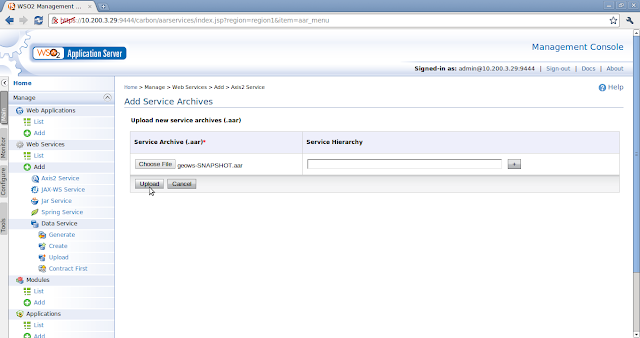 Go to Add -> Proxy Service as shown below. Next a 3 step wizard will appear. Step 1 of 3 will be to fill in basic settings. Proxy Service Name - HCCService (leave everything else as they are). 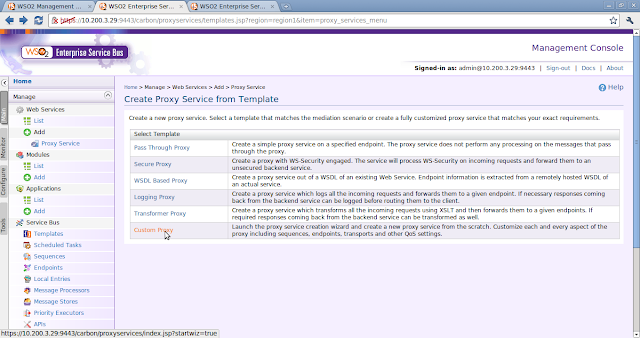 (Alternatively you could publish a WSDL for the proxy service if required. You can find the WSDL for the HCCService here). 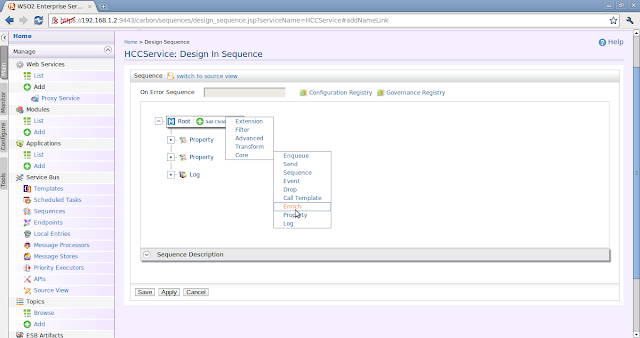 For step 2 of 3, which is to create the in sequence, select Define Inline and click on Create. 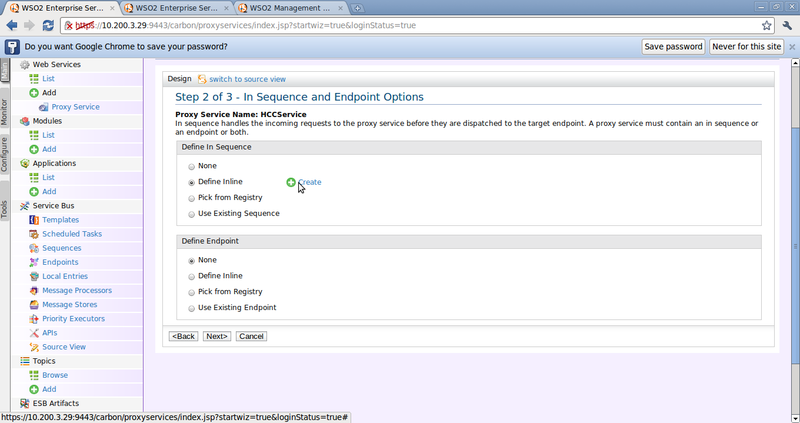 (You can define an endpoint if you do not want to mediate the incoming message instead of defining the in sequence). You will now see a graphical editor to add mediators to sequences. Click on Add Child. We will first add a property mediator. Add Child -> Core -> Property. 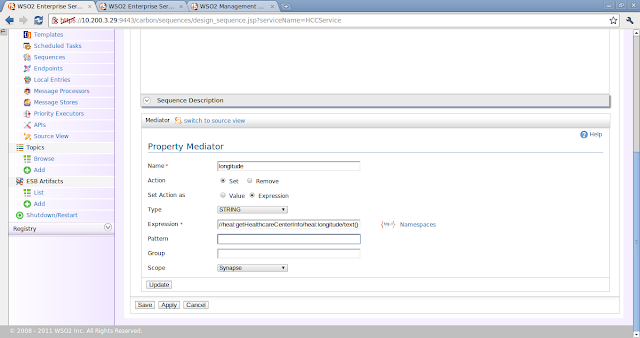 The editor will now have a new child node, which is the property mediator. Let's take a look at the request message before we set the properties of the property mediator. We need to obtain the longitude and latitude values to pass on to the GeoService service. The property mediators will be used to store the values of longitude and latitude. 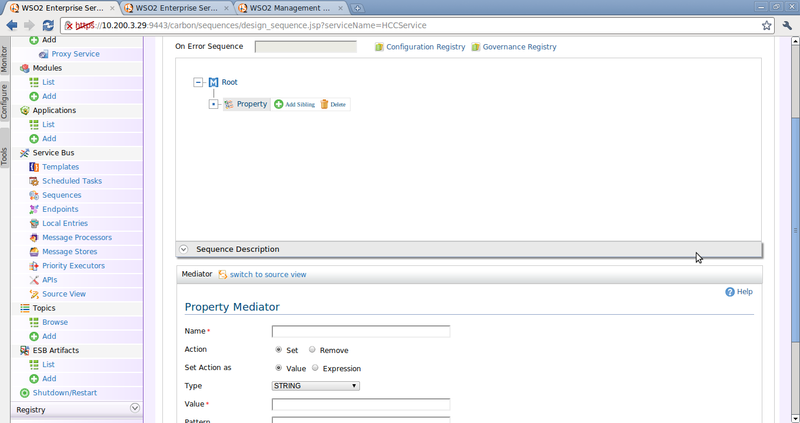 Click on the property mediator and go to the properties view below. Give the following values. Action - Set (The action can be set or remove. 'Set' to add a new property and 'Remove' to remove a property with the given name). 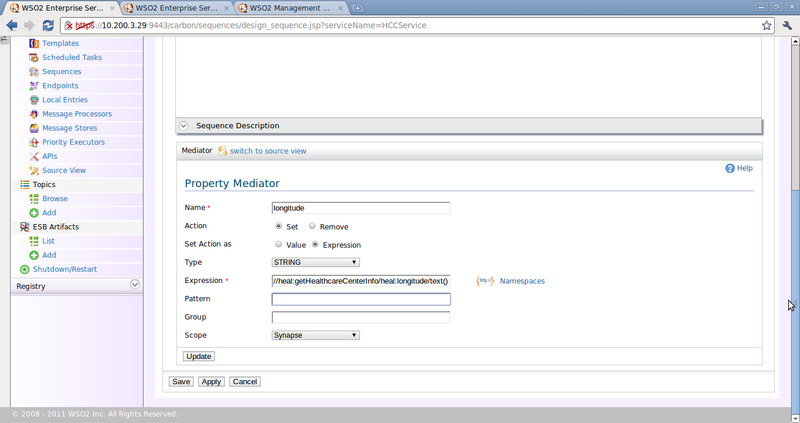 Add another property mediator and add the following properties as shown below. For more information on the property mediator check here. Let's now add a log mediator. 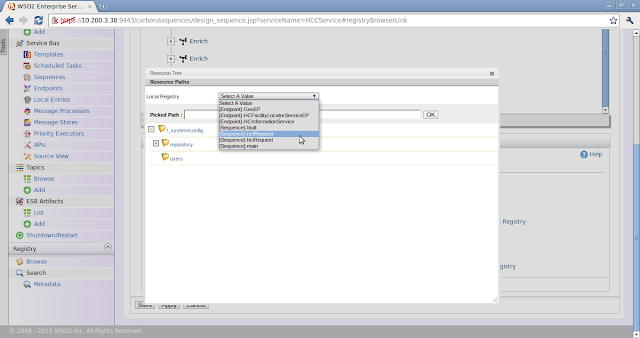 In the properties section add the properties as given below. 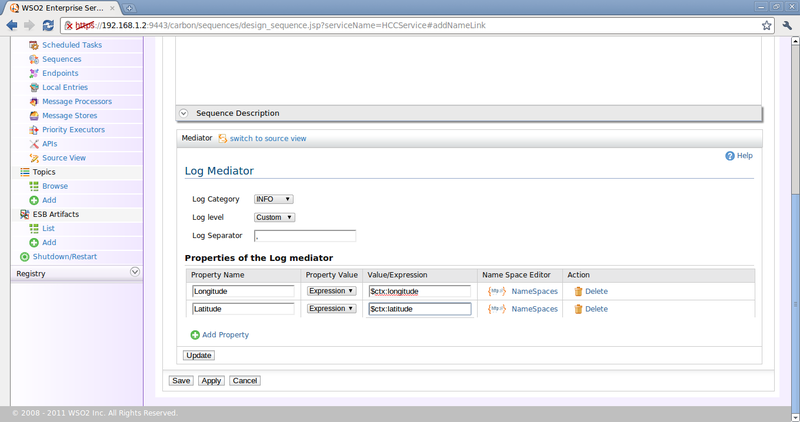 Add properties for the log mediator. Longitude and Latitude values will be loggged because the Log level is Custom. 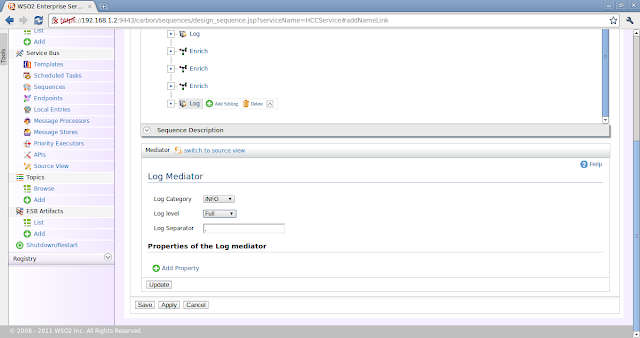 For more information on the log mediator check here. As shown in the screenshot below, let's add an enrich mediator now. For more information on enrich mediator check here. 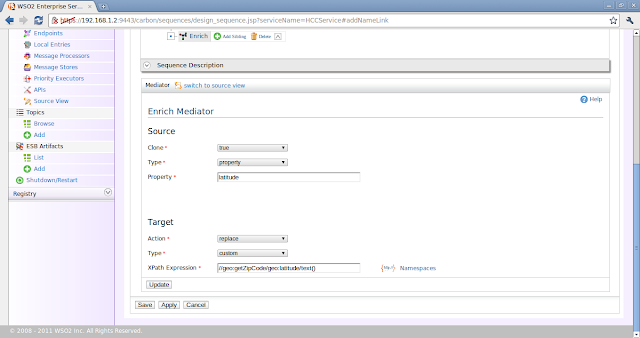 Actually, we can avoid using the enrich mediator here and use the payloadfactory mediator instead. You can see the reason for this later where I explain about its use. 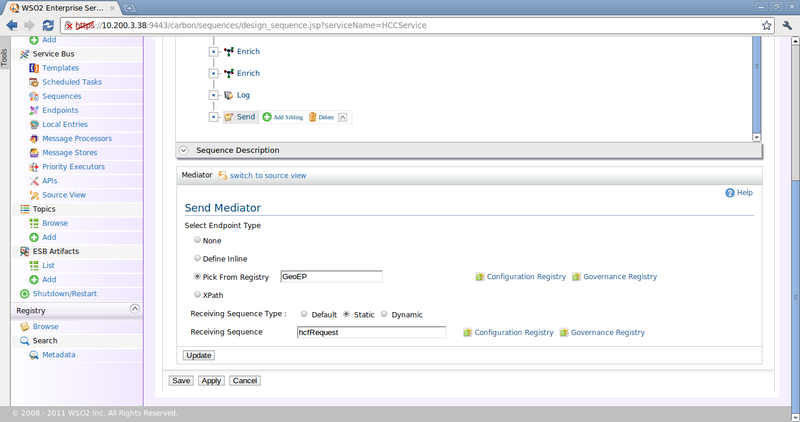 With the enrich mediator we will be replacing the body of the message with the body of a request message that goes to the GeoService. Give the following values for the enrich mediator as shown. Inline Content should be chosen from the radio buttons. 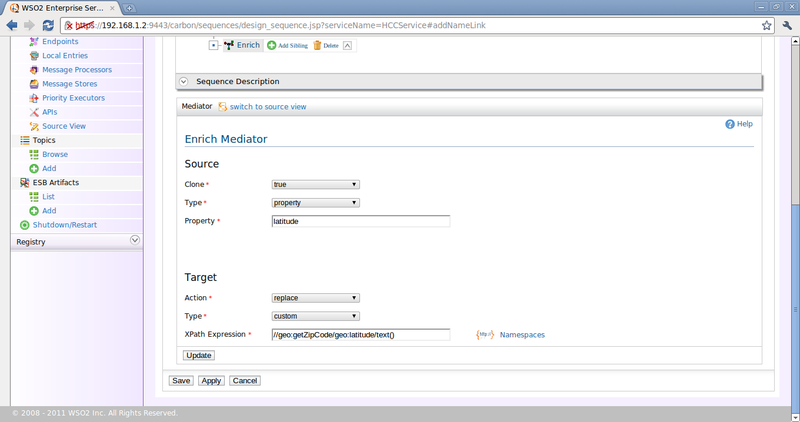 Add another enrich mediator and add the following values. This is used to replace the longitude value of the body with the longitude value received by the proxy service. Add a 3rd enrich mediator as shown below. This is used to replace the latitude value of the body with the latitude value received by the proxy service. This will be similar to the previous endpoint except for the values for the following properties. Add another log mediator as shown below with the given properties. 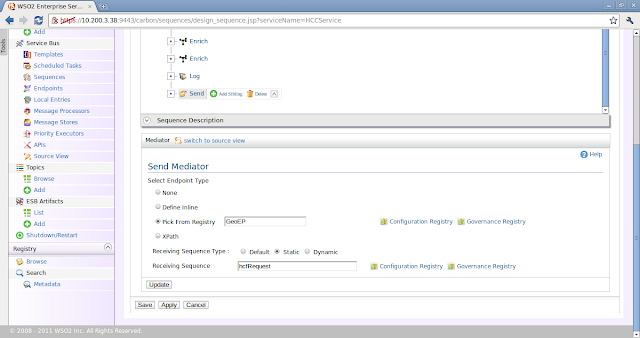 Finally add a send mediator as shown below. Add Child -> Core -> Send. Following is the screenshot when everything is complete for the send mediator. 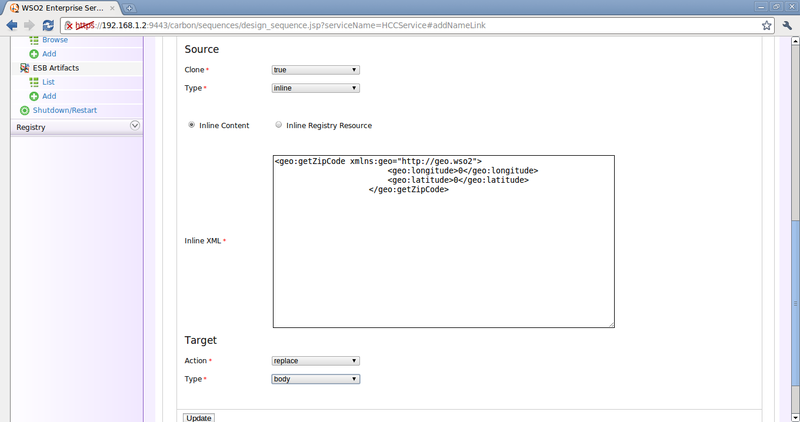 Select Endpoint type - Pick from Registry (browse in the configuration registry as shown and select GeoEP endpoint). 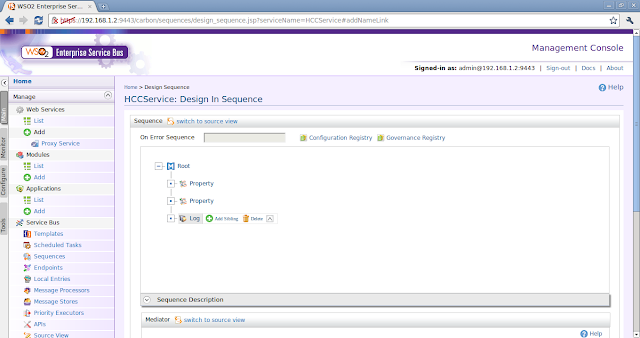 In the properties view of the send mediator, the receiving sequence type should be selected as static (or dynamic if calculated using a XPath). The receiving sequence (hcfRequest) can be selected and given as shown below. For more information on the send mediator click here. Note that hcfRequest is a sequence that needs to be created. When the screenshot was taken hcfRequest was already created and added as the receiving sequence for the ease of understanding. 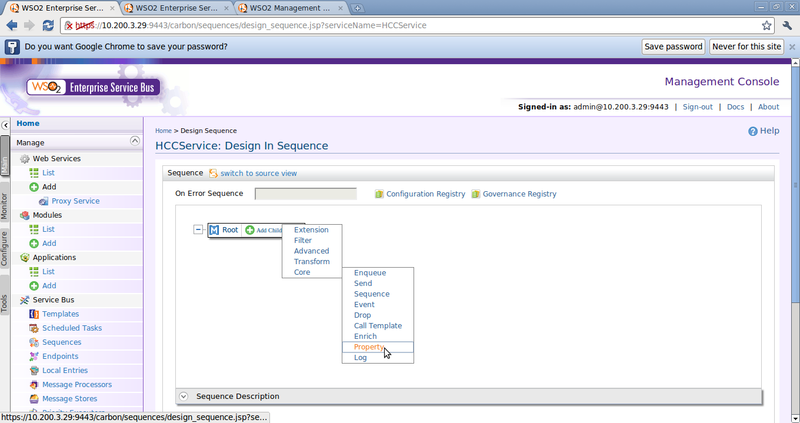 Since you have not created hcfRequest sequence at this point, after creating the send mediator, save the proxy service and let's get on to creating the hcfRequest sequence. After creating it, come back to the send mediator and add the sequence as shown above. hcfRequest will be created in part 3 of this tutorial series. 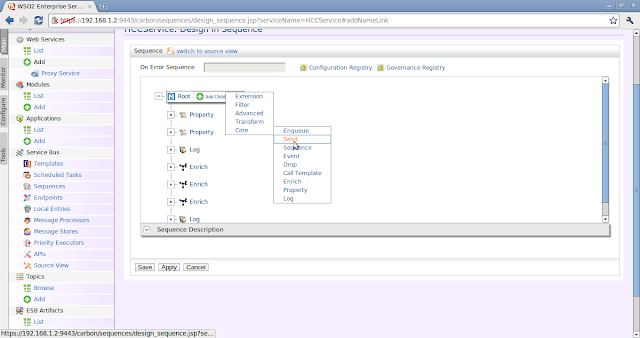 Click on "Namespaces" (in blue beside the field). A popup is displayed asking for the prefix (heal) and the uri (http://healthcare.wso2). Yes, I have missed that step :( . Please define the namespace 'heal' as http://healthcare.wso2 as instructed by Yaya. Thanks Yaya!